The time is our own, when rustlers have given way to drug-runners and small towns have become free-fire zones. The story begins when Llewelyn Moss (Josh Brolin) finds a pickup truck surrounded by a sentry of dead men. A load of heroin and two million dollars in cash are still in the back. When Moss takes the money, he sets off a chain reaction of catastrophic violence that not even the law -- in the person of aging, disillusioned Sheriff Bell (Tommy Lee Jones) - can contain. As Moss tries to evade his pursuers -- in particular a mysterious mastermind who flips coins for human lives (Javier Bardem) - the film simultaneously strips down the American crime drama and broadens its concerns to encompass themes as ancient as the Bible and as bloodily contemporary as this morning’s headlines. 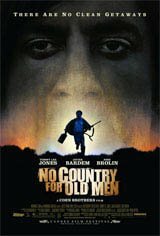 Based on the novel by Pulitzer Prize-winning author Cormac McCarthy.